Summary: Two hundred years after a stronger, faster, nearly invincible race takes over the earth, the Superiors rule humanity with scorn and an iron fist-or iron fangs. Though Superiors raise humans simply as livestock to sate their hunger and sustain their immortal lives, Draven Castle, a discontented, lower-class Superior, will never have the funds to purchase his own human. Review: Imagine knowing that sometime during the night a vampire is going to feed off you. You don't know when or it is painful, and you already have several bite that aren't completely healed, but you are under instructions to obey the Superiors who have superiority over yourself- a human. 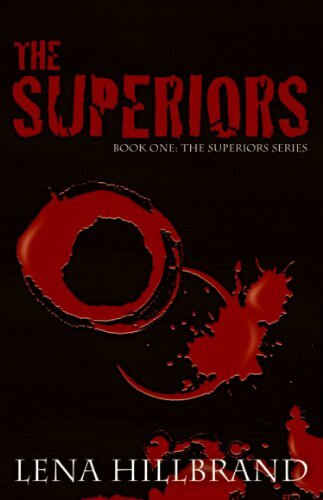 The Superiors is unlike any other vampire book that I have read. Lena creates a whole new world where vampires- known as the Superiors take over the area. They were evolved from humans and now feed off homo-sapiens. These humans are practically made to work at places where there blood can be offered for other vampires to eat. Cali is a human being in a world that is now run by superiors. She ran away from her family once, hoping to gain more freedom, but she finds out that life isn't always greener on the other side. Working in a restaurant where Cali is constantly being bitten by superiors when they are hungry, she does not have a say in much, if any. For being a weak human among a bunch of powerful vampires, Cali is a pretty tough girl. Draven, who is a good looking vampire, and my newest book boyfriend, is drawn to Cali because he likes the taste of blood. He is torn between decisions of obeying the law and his own desires. I enjoyed both of these characters and am excited to see what happens with both of them as the series continues. It is a wonderfully enticing and compelling novel, in a world that I wouldn't have been able to imagine until now :-) The story takes you on an adventure that will have yourself wondering what you would do if it was yourself in Cali's or even Draven's situation. I recommend this book to anyone who loves vampire books. The Superiors takes vampire novels to a whole other level! !